Recently, Morgan Freeman came to my town to help celebrate the opening of one of his restaurants, Pig ‘N Whistle BBQ. He came around and greeted every table and talked with each guest, and everyone was getting their picture taken with him. I had a stroke of genius, though, and had my phone out. When Mr. Freeman reached our table, I asked if he would be so kind as to record a message for me. He said yes. 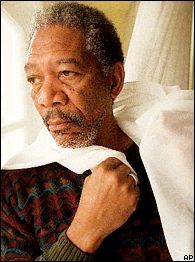 Now I have this on my cell: “This is actor Morgan Freeman, Barnz is away from his phone right now but leave a message and he will call you back, I hope … I hope.” Is there a better choice for voicemail and a specific person to leave it? It’s pretty funny – can you think of anything better?